As you know I have been spending a lot of time working on my Visual Novel rather than writing in this blog, which is a good thing, because I want to get it done just as much as some of you want to play it. Part of doing this project faster and better involves extensive use of the 3D Content Community. I have never really talked about it much, it is kind of an odd subculture, so I thought I’d give it a shot. One reason some of you might be interested in learning about the 3D Content Community is that getting into this hobby has never been cheaper. Daz 3D has released 3 programs for free during the month of February, including Daz Studio Pro 4, Poser’s main competition. Why would they give away $800 worth of software for free? Well Hexagon and Bryce are easy to explain, they are minor 3D programs with lots of competition. The “professional” community primarily uses Autodesk’s 3D Studio Max and Maya, these are the “Photoshop” programs in 3D and if you want to do this stuff professionally, it is what you need to know. The cheaper and easier alternative is another Daz 3D owned property Carrara. It’s the “Paintshop Pro” of 3D, and gets a lot of support online. Not only it is easy to learn, it can open and save 3DMax files. The free open source option is Blender, and its the GIMP of 3D. Blender was the first to export SL “Sculpties”, making it popular in the Second Life community. Left out in the cold is Hexagon (a 3D object builder) and Bryce (a 3D scene building program specializing in terrain building and atmosphere effects). Making them available for free builds up their market share. Daz 3D Studio Pro is becoming more and more popular. For figure animation and rendering it is in second place behind Poser, and growing in popularity as it is now equal in capabilities. Why would they give away a program that it already selling fairly well? That answer is easy. In the 3D community, the money is not in the software sales, it is in the content sales. Getting more people interested in buying 3D content is the name of the game. Daz (formerly Zygote) is the most popular provider of 3D content. They make the “Millenium” models, the most popular is Victoria and Michael. Victoria 4 and Michael 4 have been out for about 4 years now and far and away the largest amount of support, especially when it comes to vitally important accessories, like clothes, hair, textures, shapes, poses, and sets. 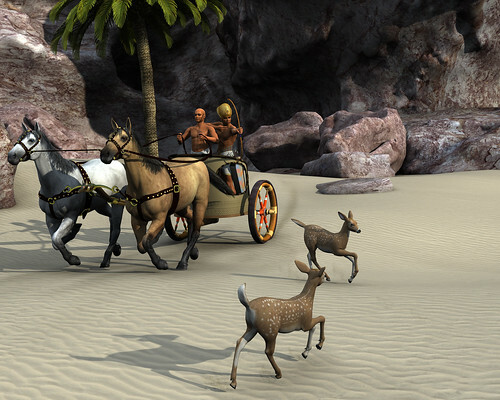 Recently Daz 3D introduced the “Genesis” model, which is a higher resolution version of Millenium, and Victoria 5 is the premiere product on this platform. The problem with Victoria 5, is the same problem for all new models: Very little content. That will change in time as the model gets more popular, but for now Victoria 4 is the queen of content, and the difference between V4 and V5 is not big enough for people with large V4 inventories to switch. Hence Daz 3D needs new users, and giving away Daz 3D Studio Pro, will hopefully make that happen. You can also get the base model Victoria 5 for the cost of a magazine. Now that I have shown you how to get into 3D art, the next question is “why?” The answer varies from person to person. Mostly it is some creative outlet. Renderosity was built on being a showcase for budding 3D artists to show their work. Now that deviantART and Flickr have taken over that role, Renderosity has become the largest content provider. A lot of us got into it by doing interesting stills. I myself have taken some photography classes, and I have used the things I have learned in photography to help my 3D stills work. What drove me was an interest in animation, which proved to be a lot of work, so I took an in between route and learned to tell stories with pictures. This has proven to be an awesome creative outlet, not too difficult or expensive, and lots of fun. I am finding 3D story telling communities popping up, and I find it rewarding how many quote my dating sim as an influence. There are dozens of websites that specialize in 3D models, mostly for the professional Autodesk users for commercial renders and animation. Since my program of choice is Poser, I limit myself to sites that specialize in Poser content. The above mentioned Daz 3D and Renderosity are the two most popular, rounding out the top 3 is Content Paradise which is owned by Smith Micro, the makers of Poser. Their library is more extensive than the other two, but the quality control is not as tight, I use it for stuff I cant find anywhere else. As usual, there is also the “free” content sites, the largest is ShareCG. I have managed to find some good quality stuff there, but a lot of it is unusable. Be careful with the licensing on that site too, a lot is “non-commercial” only. 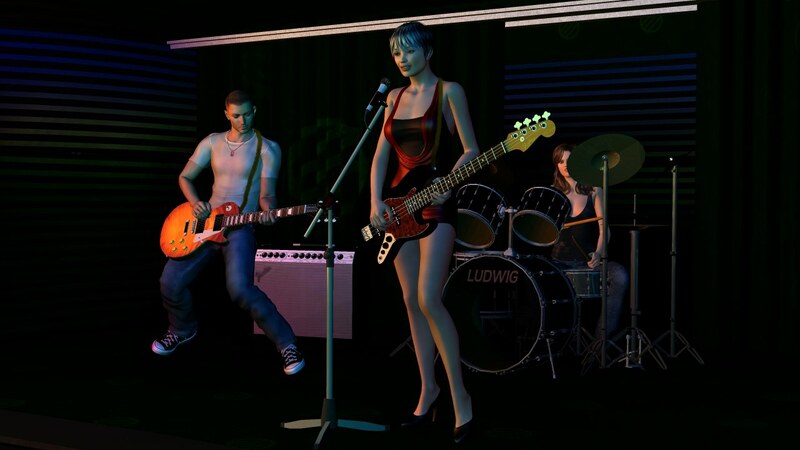 The guitars and drums in the picture up top came from this site by a 3D artist Music2u4u. I wish these props were more animate-able, but they are great quality for “free” models. 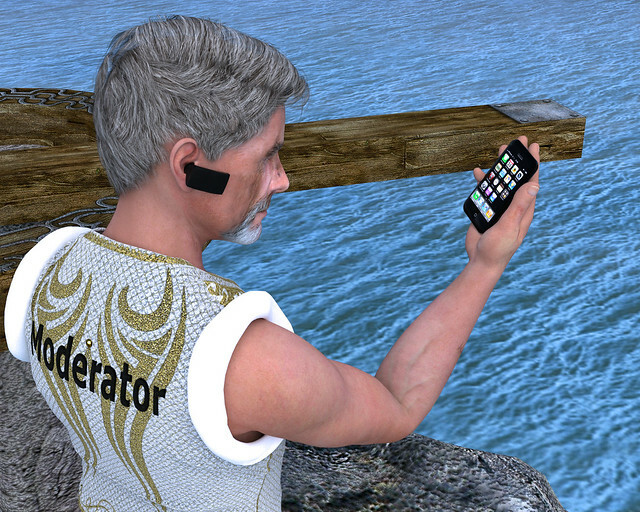 In a future post I should like to discuss the differences between the 3D content community and the Second Life content community, and how they could learn from each other. Meanwhile, I got some new toys to play with. I started out much like you, wishing to do animations, but I discovered that there was this issue of ‘poke-through’, and that was a wrench in the gears. So I mostly do still pictures, varies from everything from science fiction to ancient fantasy. The best picture I’ve done so far are the Egyptian-themed ones were I do some beta-testing of props. When they released DS4P and Bryce for free, I grabbed them, and my new ‘plans’ are to start learning Bryce (for landscaping and exterior shots). I’ve previously (and still are) working more and more with Photoshop to see how I can achieve better results. Yeah, another thing. I’ve come to learn some more stuff about Poser (I have version 7), as I use it to make props from imported objects and load the PP2’s into DS and create DS-mats for them. So, all in all I’m learning a few more programs, and using them in my pipeline. Well as you know, I started taking an interest in 3D art and animation after being introduced to Ariane. Fooled around with Poser and DAZ studio before settling on DAZ (makes their recent announcement a second Christmas for me). DAZ isn’t as well laid and organized as poser, but you do kind of get ‘the best of both worlds’ as it were and there’s plenty of support out there. Building a new rig next week so I’ll finally be able to judge it’s full potential.